Why have you chosen this venue? Since joining the company in November, the Eden collection has stood out to me! One of my first site visits was to The Greenway in Cheltenham, where I instantly fell in love! But after seeing Mallory Court it’s definitely my favourite venue to date. The property is a lovely traditional Manor House which pairs nicely with the contemporary outlets of meeting space known as the Knights Suite and Orchard House. Mallory Court is set within 10 acres of beautiful grounds in Leamington Spa offering 43 bedrooms in total, perfect for both corporate and leisure guests. The Knights Suite welcomes you into an open, light, and bright foyer, ideal for drinks receptions or refreshment breaks. The foyer offers 1 large meeting space which can also be sub-divided into 3 smaller meeting areas. The maximum capacity of the Knights suite is 50 boardroom style, 100 cabaret style, 150 theatre style, 160 banqueting style and 120 for a dinner dance, highlighting flexibility to client’s requirements. Coupled to this space is the bar, bistro restaurant and 2 private dining rooms which are located upstairs on the 1st floor. This ensures delegates food and beverage will be served as fresh and hot as possible. The Orchard House and Spa is a 2-minute walk from the Main House so although separate, the décor continues and is smoothly linked by the traditional classic features of the manor house, making this my stand out top venue! The JW Marriott Marquis in Dubai is the World’s tallest hotel, measuring an impressive 355m – After having visited Dubai recently to look at M&E hotels, venues and activities, this property stood out as a firm favourite! Boasting 1,600 bedrooms (the largest in Dubai!) split between 2 towers, the cleverly constructed hotel has just 14 rooms per floor, giving a more private and secure feel. 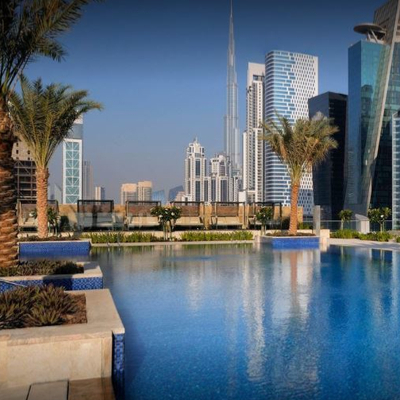 The two towers are joined up to the 7th level, where there is a beautiful outdoor swimming pool with stunning views of the surrounding skyline. The JW Marriott is a fantastic event venue, providing 32 meeting rooms, and two large ballrooms – the largest is the Dubai ballroom that can seat 1,548 delegates in a theatre style. The service levels are 5* and the endless breakfast options are fit for a king! Hogarth’s Stone Manor is a great venue for all types of corporate events. They have great spaces for up to 170 delegates for private dinners, meetings, conferences, Christmas parties…the list is endless. The venue is also great for team building exercises as the building is set within 27 acres of woodlands and grounds and in the Summer months they offer outdoor drinks receptions and BBQs allowing the delegates to see all the great features the venue has to offer. Hogarth’s Stone Manor really stood out to me as the staff, service, food, conference facilities and the location were all great! If you think any of the above venues could work for your next event, get in touch! Why don’t you let us know what your favourite venue you have seen recently is?